Aquascape Fiberglass Stone Composite has all the natural beauty of real rock with the added durability and light weight of fiberglass. 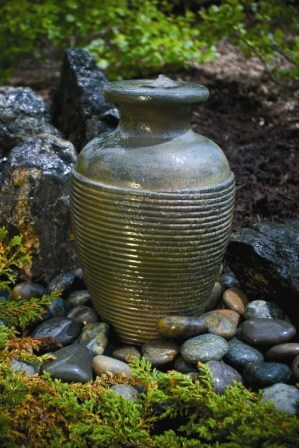 This fountain creates the soothing sounds of trickling water, making it the focal point of any setting. Incorporate the sight and sound of water to your garden, deck, patio or balcony. For an instructional Fountain Installation videos and more information on theAQUABASIN & Installation Tips, click on the links at the end of this statement. "VIEW VIDEO#1", "VIEW VIDEO#2"
I would like to penetrate the Aqua Basin and install an automatic float valve that will be connected to a nearby water . . .
4/7/2010 – I live in zone 4 can this fountain be left out in winter? we can have below -25 weather once and a while.